“Bonne fête!” mon mari sweetly exclaimed in a mid-morning call. Similarly, all the Frenchies I’ve crossed paths with today have been generous with their 4th of July wishes. But at the same time I dream of Cheddarwursts, first-degree firework singes and backyard barbecues. I had a rendezvous in the 16eme this morning, in the shadow of the Eiffel Tower. The most American thing I could do was point, reacquaint myself with her glory and take a proper phone pic. I assure you I wasn’t the only one. Next Post ready, set, SUMMER! Thanks for sharing a taste of your 4th! Enjoy the long weekend. It’s a good one! Pulled pork & coleslaw! Happy 4th, Jessie! And from one American expat to another…you are KILLING ME with that sandwich. Happy Fourth to you, Jessie! Our street is festooned with flags and soon the aromas of my neighbors’ grills will waft across our yard. It’s so hot and humid that I opted for chicken salad,etc . 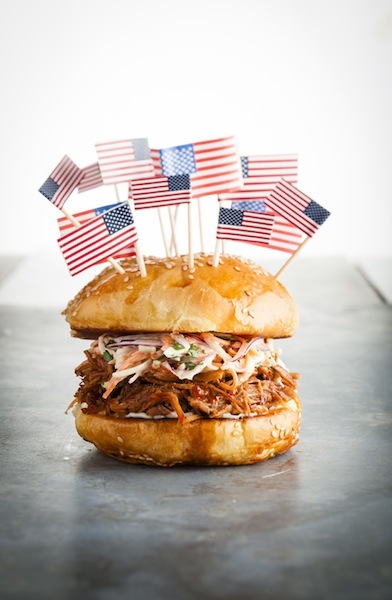 What a fabulous sandwich….flags and all. My best wishes.